Heads up! If you’re looking to quickly pick up or even perfect your Korean typing skills, the best way is to purchase a Korean/English hybrid keyboard like this one. These keyboards have both English and Korean characters on each key cap, so you can quickly learn the Korean equivalent of each character, word and sentence you type! Unlike languages such as Spanish or French, Korean cannot be written using Roman characters (unless you write in Romaja, which isn’t proper Korean). This makes it a little tricky to type on a computer. Be assured that it is possible to type Korean on your Mac, but there are a few things that you’ll have to do and learn beforehand – Which is what this article is about: How to type Korean Hangul on your Mac using a standard, American keyboard and an English operating system. 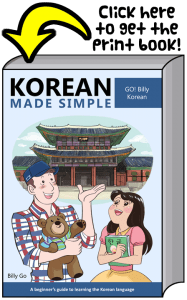 If you’re learning how to speak and type Korean, we highly recommend the Korean Made Simple book series. It’s a great guide to help you learn Korean and speed up your learning. There are two main ways to type Hangul on your Mac. 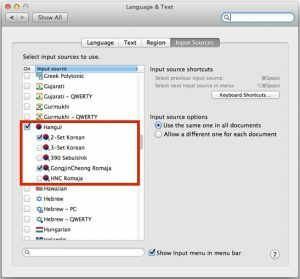 You can use the Gongjin Cheong input method, which works by the user typing Romaja and Mac OSX converting it to Hangul characters on the fly – This method is probably easier for beginners, as you only need to know how the Korean words are spelt in Romaja. However if you are more experienced, or want to type Hangul the “proper” way, there is the 2-Set Korean input method. With this input method each key on your Mac’s keyboard is assigned a Hangul character, and you simply press that key to type that character. This could be faster than the Gongjin Cheong method if the typer is experienced, however the obvious drawback is learning where all the characters are. It’s like learning to type all over again! If you want to type Korean on your Mac, you’ll first have to enable some Korean input methods. Doing so is quite straightforward – Simply open the system preferences, click on the “Languages & Text” pane, then go to the “Input Sources” tab. From here you can select input methods via the big list, so scroll down until you see “Hangul” and tick it. You’ll notice that once you tick Hangul a sub-menu will open up, allowing you to select how you want to input Hangul. So tick both the “2-Set Korean” and the “Gongjin Cheong Romaja” boxes, as is illustrated in the screenshot below. 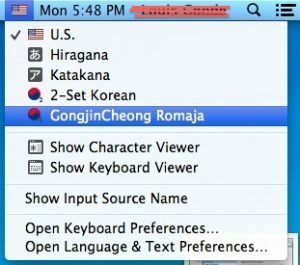 To type using the Gongjin Cheong Romaja input method, click on the flag in your Mac’s menu bar (it should be in-between the battery meter and the date/time) before clicking on “GongjinCheong Romaja”. You’ll now see that the flag in your menu bar has changed to a blue and red circle, indicating that your keyboard is set to Gongjin Cheong Romaja. To type in Hangul using this input method you must type the Romaja for the Korean word, which will automatically be converted to Hangul as you go. For example, if you wanted to get “한굴”, you’d type “hangul”, as it is the Romaja for “한굴”. Or if you wanted to get “사랑해” you’d type “saranghae”. Try it for yourself. Typing using the 2-Set Korean input method is a little trickier. Once you selected the “2-Set Korean” option in the menu bar, each key on your Mac’s keyboard becomes dedicated to one Hangul character. So if you press “k”, for example, you’ll get “ㅏ”. Or if you press “f”, you’ll get “ㄹ”. Fortunately Mac OSX groups the characters into blocks for you as you type, so if you press “t-k-f-k” you’ll get “사라” rather than “ㅅㅏㄹㅏ”, making things a bit easier. Some people find using keyboard covers a better way to type without having to remember shortcuts or mess with software settings. 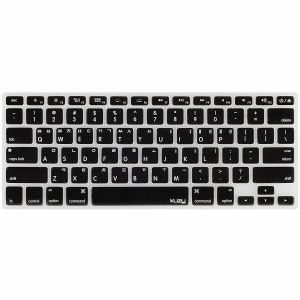 We recommend this high quality and super affordable Korean character MacBook keyboard cover for only $8.99. The main issue with the 2-Set Korean input method is the fact that you’ll have to remember where every Hangul character is on your Roman keyboard. Memorising the layout is one way to overcome this, however it’s a long and strenuous one. A much easier way is to purchase a set of Hangul keyboard stickers – Cheap to buy and easy to apply, the stickers are transparent and display the Hangul characters alongside the English ones on each key. So if you’re interested, check out the Amazon listing on the left. MacInfo is a participant in the Amazon Services LLC Associates Program, an affiliate advertising program designed to provide a means for sites to earn advertising fees by advertising and linking to Amazon.com. We may earn a small commission on sales of some products listed on this site.